Until twenty or so minutes before The Day of The Doctor ended, it felt almost just like any other Doctor Who episode. Aside from a few extra Doctors than is strictly the norm, the plot seemed average enough. But that didn’t matter: what story could possibly live up to 50 years of mythology and the expectations of millions of fans? 10, 11, and, who, or what, exactly? A mind-bending story might raise the stakes, but they’ve been risen before. Those generations of fans, gathered since 1963, all watching this story at the exact same moment, are doing so for the same reason: because they love The Doctor. 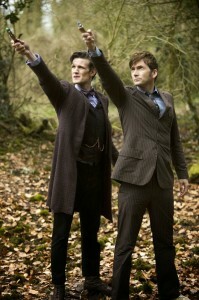 What better tribute to them, and to the show that unites them, than to focus instead on The Doctor himself? Of course, the episode had to then take a crazy turn and completely change the whole game as we’ve known it since 2005. Spoilers from here on, so be warned. Gallifrey lives. The Doctors — 10, 11, and 8.5 (ok, so technically he’s 9, but I’m not going to start changing everyone’s numbering now) — hatched a plan to save their planet and their people from destruction in the Time War. 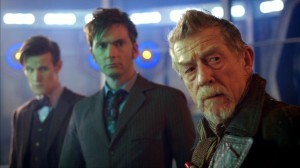 That event, and being the one to pull the trigger, is what’s defined The Doctor since his ninth incarnation. It’s the past he’s always been running from, the shadow that’s always been cast over him (though lately we’ve also seen the future shadow of Trenzalore box The Doctor into a corner with nowhere to run). It’s also the real event around which The Day of the Doctor revolved. Sure, we got Elizabeth I, U.N.I.T. in the Tower of London, and some more aliens bent on conquering the world, and it was lovely to see so many old and new friends, but the real meat of the episode was in the titular day. 8.5 never made it into the count of Doctors because he wasn’t one; rather, he was The Warrior, the one who spent his life fighting in the Time War and ended it by, well, ending it. 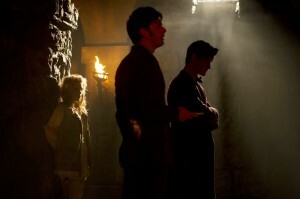 But for one day, with the aid of all his former and future selves, he got to be The Doctor once more. For the first time since taking up his chosen name, he was able to apply it to himself. Multiple Doctors have helped each other out of scrapes before. The 13 Tardis’s flying around Gallifrey and removing it from the path of Dalek destruction may have allowed 8.5 to regain his title for one day; however, 10 and 11 were able to uphold it for their most feared incarnation on their darkest day. When they placed their hands on the big red button, so 8.5 wouldn’t have to face The Moment alone, that is when The Doctor healed himself. And for me, that’s when the episode really became something more, really lived up to all the hype and the decades of storytelling. Of course, there might be doubts about how it was possible, how all the time travel worked, how The Doctor got the message out to himselves. I confess to never really trying to understand all the wibbly-wobbly stuff, because it always gives me a headache – either because I can’t figure it out or because it doesn’t make sense and I’m supposed to think that it does (an affliction I’ve frequently suffered under the Moffat era). I’m not going to try to figure those out today. I’m also not going to speculate on what this might mean for the future, both for 11 specifically and for the show and mythology as a whole. I’m not even going to dwell on the one or two things that may have annoyed me (well, except for one: she was never really Rose! You don’t get to tease us with her return and then have it not actually be her! I’d rather have The Moment take an unfamiliar form than to see Billie Piper again as NotActually!Rose, Bad Wolf allusions or not. Grrr.). None of those things really matter, because today is The Day of the Doctor. We can question and quibble another time, but today is for The Doctor. It’s finally his day. Now that I’ve said we don’t need speculations, questions, quibbles, or complaints, bring it all on – along, of course, with all the squee – in the comments below.